Matthias obtained his BSc from the Université de Besançon (France) in 2006 and MSc from the Ecole Polytechnique Fédérale de Lausanne in 2008. He then moved to the UK to undertake PhD studies at Imperial College London under Dr Matthew Fuchter, working on the development of new chemical probes for epigenetics. 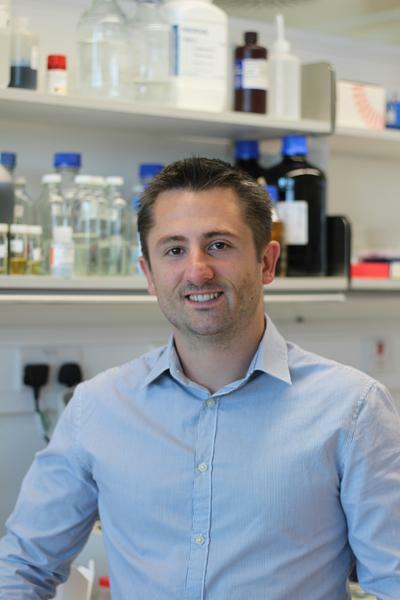 After obtaining his PhD in 2011, he moved to the University of Cambridge to work with Dr Alessio Ciulli, followed by a short stay at the School of Life Sciences at the University of Dundee. From 2013 to 2016, he worked as a postdoctoral scientist at the MRC Laboratory of Molecular Biology in Cambridge, within the group of Professor Sir Alan Fersht. He joined the School of Chemistry at the University of Southampton in September 2016. Cellular processes are mediated by numerous complex and intricate biochemical pathways, involving thousands of biomolecules interacting with each other both in a temporal and spatial manner. As such, probing the spatiotemporal roles and interactome of a biomolecule in its native environment remains a formidable challenge. Despite the continuous progress in omics and structural biology techniques, our understanding of how proteins interact with each other and achieve their downstream physiological effects remains in its infancy. In particular, protein-protein interactions (PPIs) have received a great deal of attention lately, and opened new perspectives for therapeutic interventions through their modulation. Studying PPIs is a difficult task, notably due to the size of the macromolecular assembly (e.g. several MDa), the highly dynamic nature of protein-protein association, the structural adaptability of their interfaces to allow such association, and the dependence of such association on post-translational modifications (PTMs), which are themselves dynamic and regulated by many other proteins. Despite such obstacles, small synthetic molecules can be rationally devised to perturb protein’s interactome by potently binding to their surface. They therefore offer a powerful tool towards functional elucidation and for further therapeutic applications. Small molecules can bind and interact with a protein in many ways. Historically, the vast majority of small molecule chemical probes and drugs were developed with the aim of perturbing the association equilibria between a protein and its partners (e.g. a co-factor or another protein). However, novel and powerful chemical approaches aiming at modulating protein functions with small molecules have emerged in recent years, opening new perspectives in biology and drug discovery. Our research is multidisciplinary and strongly relies on synthetic organic chemistry and biophysical techniques (e.g. DSF/DSC, ITC, NMR spectroscopy), combined with chemical/structural biology and computational methods (e.g. docking, QM). Our primary focus is on the development of chemistry driven approaches to modulate proteins’ physiological activity in a wide sense, with the ultimate goal to deliver new tools to study proteins’ function in living systems. Whenever possible, we exploit the knowledge gained from these studies to attempt tackling difficult problems in human health, notably in cancer, in collaboration with teams of biologists.